Is it safe to eat pizza that was left out overnight? Will I get sick if I eat a hamburger that is still pink inside? College students living away from home for the first time may be looking for answers to such questions that will not appear on any tests. The United States Department of Agriculture (USDA) provides answers to some of these frequently asked questions on food safety. Several slices of pizza have been left out over-night. Is the pizza still safe to eat? No. Perishable food should never be away from refrigeration for more than two hours. This is true even if there are no meat products on the pizza. Foodborne bacteria that may be present on these foods grow fastest at temperatures between 40 and 140 °F and can double in number every 20 minutes. Pizza should never be away from refrigeration for more than two hours. I will be attending a tailgate party at the stadium and eating hamburgers. How can I be sure the burgers are fully cooked? The only way to know hamburgers are safely cooked is to use a food thermometer. Do not use color to tell whether food has been thoroughly cooked. Ground beef may turn brown before it has reached a temperature at which bacteria are destroyed. A hamburger cooked to 155 °F, properly measured with a food thermometer, is safe—regardless of color. An instant-read thermometer is easy to use and a must for preparing foods safely. They can be purchased from most grocery or “kitchen” stores for under $10. These thermometers are not designed to remain in food while it’s cooking but will read the temperature in 10 to 20 seconds depending on the type and when placed according to manufacturer’s instructions. (A thermometer may have to be inserted sideways in a hamburger to get an accurate reading.) For more information on using thermometers to determine if foods have been cooked to safe temperatures, see HGIC 3580, Cooking Meat Safely. Our dorm has a kitchen with a microwave on each floor. When I microwave the food according to the package’s instructions, it’s still partly frozen. Why doesn’t it get hot enough? In a large building like a dorm, electrical equipment such as computers, toaster-ovens, hair dryers and irons compete for current and reduce the electrical wattage of a microwave. A community microwave oven that has been used just before you, will cook more slowly than a cold oven. To compensate, set the microwave for the maximum time given in the instructions. Also, avoid using an extension cord with the microwave oven because power is reduced as it flows down the cord. Cover foods during cooking. Remember to stir or rearrange food and rotate the dish. Use a food thermometer to ensure the food reaches the appropriate internal temperature. (See the Minimum Internal Temperatures chart on the last page.) For more information on using a microwave oven safely, see HGIC 3586, Microwave Food Safety. My home is only a four-hour drive away from college. How can I safely pack leftovers to bring back to school? For a four-hour drive, food must be handled properly to keep it safe from spoilage and pathogenic bacteria. Leftovers should be divided into shallow containers and cooled in the refrigerator prior to the trip. Pack the food in an insulated cooler packed with several inches of ice or frozen gel packs. The temperature inside these containers should be at or below 40 °F. Return the food to the refrigerator as soon as possible. Bacteria that contaminate food and cause foodborne illnesses are everywhere. Follow these four basic safety tips to keep your food safe. 1. Wash Hands and Surfaces Often: Always wash your hands before preparing food and after touching raw meats or anything that will contaminate your hands. Bacteria like Staphylococci are found on hair, skin, mouth, nose and throat. Seemingly innocent acts like scratching the scalp, running fingers through hair, touching a pimple, coughing or sneezing can transmit thousands of microorganisms that may cause disease. Step 1. Wet hands thoroughly with warm water. Step 2. Apply soap generously. Step 3. Rub hands for at least 20 seconds. Step 4. Rinse hands well with warm water. Step 5. Dry hands using a clean paper towel. Keep kitchen surfaces clean by washing counters, cutting boards and equipment with soap and water immediately after use. Sanitize with a chlorine solution of 1 teaspoon liquid household bleach per quart of water, especially after contact with raw meats. 2. Prevent Cross-Contamination: Cross-contamination is how bacteria spread from one food product to another. This is especially a concern with raw meat, poultry and seafood. 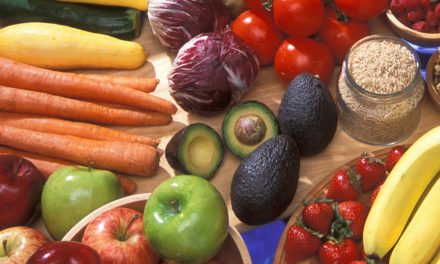 Keep these foods and their juices away from ready-to-eat foods. Separate raw meat, poultry and seafood from other food in the grocery cart. Store raw meat, poultry and seafood on the bottom shelf of the refrigerator so juices don’t drip onto other foods. If possible, use one cutting board for raw meat products and another for salads and other foods that are ready to be eaten. Always wash cutting boards, knives and other utensils with hot soapy water after they come in contact with raw meat, poultry and seafood. 3. Keep Foods Out of the “Danger Zone”: The “Danger Zone” for most foods is between 40 ° F and 140 ° F. Bacteria grow most rapidly in this range of temperatures, doubling in number in as little as 20 minutes. Refrigerate or freeze foods that will spoil at room temperature. 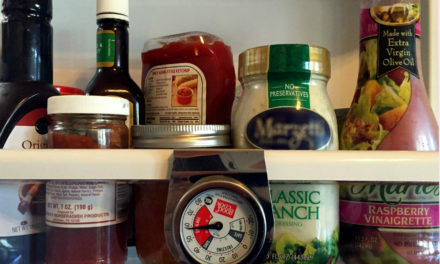 Purchase two appliance thermometers and keep one in your refrigerator checking it regularly to maintain the temperature between 34 and 40 ° F, and one in your freezer where the temperature should always be at or below 0 ° F.
Thaw and marinate foods in the refrigerator, never on the counter (except breads and other baked goods). If thawed at room temperature, bacteria can grow in the outer layers of the food before the inside thaws. When you have defrosted food for use, keep in mind that thawed frozen food is more perishable than fresh food. If thawed in the microwave, food must be cooked immediately after thawing. DO NOT thaw food and then refrigerate to cook later. Discard any perishable food left out at room temperature for more than two hours. Divide large amounts of hot leftovers directly into small, shallow containers for quick cooling and place directly in the refrigerator. Discard food that has been left standing at room temperature for more than two hours. Date leftovers so they can be used within a safe time. Most foods remain safe when refrigerated for three to five days, although ground meats and meat gravies should be kept for only one to two days. Freeze foods for longer storage. IF IN DOUBT, THROW IT OUT! Never taste food that looks or smells strange to see if you can still use it. Even a small amount of contaminated food can cause illness. 4. Cook Foods Thoroughly: Using a thermometer is the only reliable way to ensure safety and to determine that meat and egg dishes are cooked thoroughly. These foods must be cooked to an internal temperature high enough to destroy any harmful bacteria that may have been in the food. Color changes in meat are no longer considered reliable proof that all bacteria have been destroyed. Use the temperature chart on the last page to determine if foods have been cooked thoroughly. Egg, tuna and macaroni salads 3-5 days Salads made with mayonnaise do not freeze well. Apples 3 weeks Fruits may need ascorbic acid to prevent browning when frozen, and the addition of sugar for best quality. Store in freezer containers. 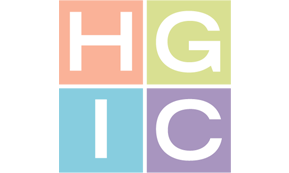 See HGIC 3067, Freezing Fruits Step-By-Step. Carrots 2 weeks Most vegetables need to be blanched or cooked before freezing to maintain quality. See HGIC 3063, Freezing Fruits & Vegetables. Note: Foods kept in the freezer longer than recommended are safe, but their quality may not be as good. Breads: Store at room temperature and use within 3-7 days or freeze. Storing in the refrigerator promotes spoilage, but in humid weather it may be necessary to store in the refrigerator or freezer (in air- and moisture-proof wrapping) to prevent molding if loaf will not be eaten within a week. For more information on food safety, log on to the Home & Garden Information Center website at http://www.clemson.edu/hgic, or in South Carolina, call toll-free 1-888-656-9988. A food safety information specialist is available to answer questions, or you can request to have information mailed to you.